Dr. Harsh Kumar is a Consultant Ophthalmologist and practices at Centre For Sight in New Railway Road, Gurgaon & Safdarjung Enclave in Delhi and Indraprastha Apollo Hospital in Sarita Vihar, South Delhi. Dr. Harsh Kumar has completed MBBS from All India Institute of Medical Sciences, New Delhi in 1983, MD (Ophthalmology) from Same College in 1985 & DNB and has expertise in Corneal, Dry Eyes, Eye Care, Eye Pain, Eye Surgery, Eyesight problems, Farsightednes, Pterygium, Lasik Surgery, Ophthalmology, Phacoemulsification, Cataract Surgery etc. 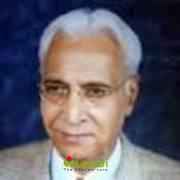 You can book an online appointment with Dr. Harsh Kumar on www.Lazoi.com.